My new book is now available everywhere. Send me a message if you would like a signed copy from me. 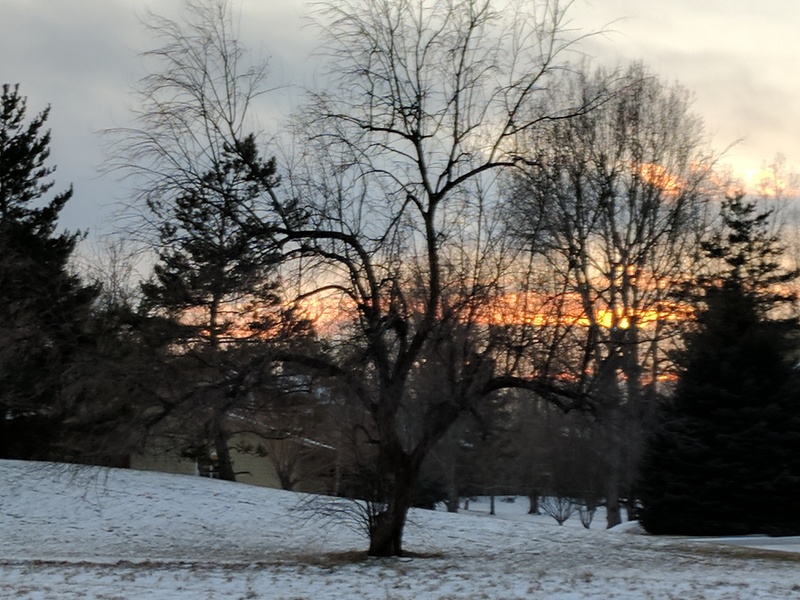 It was a cold sunset at ten degrees near the end of a 4.5 mile workout. Wasn’t going to let the weather interrupt my daily practice. Christmas was white, The Long Night (GOT) is almost over. The New Year will be green and bright and the days are getting longer. The last year and a half has been a long winter of the soul. The hardest part was early after the sudden plunge into winter a little over a year ago, recovering from repeated surgeries through the holiday season from before Christmas to the first day of spring. I had separated from the sociopathic con artist with Narcissistic Personality Disorder that wrecked my life and health. It was a lonely, stressful and difficult period, yet magical occurrences kept happening, letting me know I was on the right path despite some missteps and falls. After more than a year, there are many new stories to tell and adventures to attempt. While I can see the spring sun off in the distance, winter snows are not finished yet. Like the weather here, the soul’s life can change from icy cold to pleasantly warm or the reverse in a moment. The scattered bright glimpses of the future fuel the determination to wade through the snow with confidence. There will be snows of the season and of the soul well into spring, but the tide is turning. There is constant progress and wonderful opportunities ahead. A recent, very bright spot was the arrival of an advance copy of my next book, Wild Winemaking, an early Christmas present from my editor. I will have more copies soon and the release date is February. Advance marketing is going very well. Things are getting busier all the time. There is a business trip to Hawaii, interviews, class to teach and book signings filling up the spring calendar. There will be rehearsals as Ringmaster of The Scintillating Fire Circus to prepare for upcoming shows. Every Thursday I play the blues. I’ve been privileged to play recently with some well known musicians that have extensive regional, national and international tours, albums and honors. My half-time greenhouse production manager job will start up again this spring. Time on The Pondy, with my hands in the dirt, chickens forming a parade behind me, wildlife on the hill and in the air, 275 cases of wine in the cellar, the smell of growing food in the greenhouse, helping a good friend build his business and experiencing the weather every day is exhilarating yet peaceful at the same time. The time I spent filling the greenhouse and garden with plants was a very healing period during my medical and spiritual healing journeys. I had increased my daily workout from three and a half by doing an extra loop, three instead of two. Shortly after starting this essay two weeks ago, I doubled the length of my old daily walk/jog, with four loops to around seven miles without missing a day through up and down weather until yesterday. While I may not have burned as many calories, I spent a little over an hour hiking up and down a river, scrambling down and up over a field of large boulders to balanced precariously on rocks at the river’s edge while casting to rising trout. Mid-January with mid-sixties temperatures was just too much to resist. I substituted fly fishing for my afternoon workout that day to exercise my soul as well as my body. I did have a couple strikes, although I didn’t hook either one. A water ouzel danced along the river edge. There were a few hardy souls out there fishing. One I stopped to watch invited me down to try his pool from the opposite bank. He pointed out dozens of trout, some rising and said he hadn’t been able to get a bite. I was just looking for a short interlude and tried … and lost … several flies while enticing those bites. Feeling satisfied with my meditational river experience, I left the fisherman to continue his efforts as I moved on to continue my busy day. Stopping at The Pondy on the way back, it was so warm that Matt was shirtless, spreading and tilling a large load of composted manure into the sandy part of the garden. I needed to restock the treasure chest from the wine cellar after last weekend’s festivities and wanted to check the greenhouse progress and the kiwi wine in primary fermentation. After that warm temperature yesterday, today was twenty degrees cooler, cloudy and wet. It had stopped misting by the time I left for my walk but overnight and early morning in mid-January it had rained instead of snowing. The air felt heavy and damp. The next day the sun was shining, the sky bright blue, but it was at least ten degrees colder with a north wind. The number of people I see out there depends on the weather. When it is cold or cloudy, there are few besides dog walkers and the occasional hardy bicycler. On most days there is someone or a small group playing Frisbee golf in the park near the trail. In nice weather, there are groups lined up, waiting their turn. Besides the physical exercise, there are always encounters that rejuvenate the soul, too. A couple days ago, a woman was walking a dark brown German shorthair puppy that looked just like Cassiopeia, my shorthair that lived for 19 years. I didn’t get closer than about fifty feet as they passed in front of me, but that puppy couldn’t take its eyes off me. As I turned the opposite direction, I kept watching and the puppy kept dragging behind looking at me for a long time. It stirred memories of my beloved Cassie. I often see and hear geese overhead, sometimes like today large flocks wheeling overhead, filling the air with well over 100 honking geese. A couple days ago, I was busy writing in my head when I was startled by five squirrels in a row that jerked upright and bolted for their trees in unison. In winter there are ravens, sometimes in a large raucous flock. 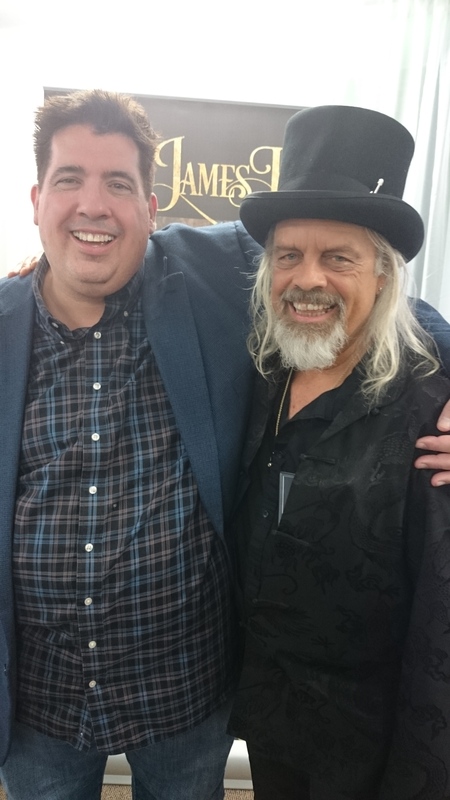 A week ago, at the Fly Fishing Show I upgraded my wardrobe with a uv protective hoody in a trout pattern on a mottled blue camo background that looked like water and a pair of flame colored tights to wear with top hat and tails in my role as Ringmaster of the Scintillating Fire Circus. Wearing that hoodie on my workout every day has me thinking about letting my inner hillbilly come out by wearing that more and the button-up sleeveless camo shirt that was designed by on old girlfriend fashion designer. This would be a change from the standard all black artist/author “uniform” that is my typical wear. Three times since I started wearing that hoodie I have received compliments about it including an attractive younger woman that engaged me in conversation. Of course I get compliments every time I wear my top hat with my all black wardrobe. Perhaps I just need to change it up some. Don’t want to become too predictable. It would certainly startle some of my friends who haven’t seen me dress like that for years. I will continue to enjoy my daily walks, even on those cold winter days with the sun low on the horizon. The days are getting longer and brighter and I don’t want to miss any of it. Over the last four years I have dropped more than forty pounds and four inches in my waist size. While some of this is due to the daily workouts I’ve done over the last eight months, I believe the primary reason is the morning protein smoothie I drink for breakfast which fills me up enough that I no longer eat lunch. At first the base was organic coconut milk but I have improved this by alternating with organic plain yogurt containing live probiotic cultures to support my digestive system. Proteins are added with three raw organic eggs and whey protein powder. Maca root powder, a superfood grown in the Peruvian Andes is also included. Flavor and antioxidants are added with frozen wild blueberries. I’ve recently begun adding a second fruit for added flavor, vitamins and antioxidants. Often a banana, but sometimes other fruits in season such as pear, pineapple, peach, blackberries or raspberries. The most recent additions are golden flax seeds and turmeric. Golden flax seeds taste better and are more nutritious than dark seeds and are a strong source of omega-3 fatty acids, fiber and micronutrients. Turmeric is well known as an anti-inflammatory and has many other health benefits. This is the best breakfast I’ve ever eaten. I used to have what I thought was relatively healthy, sugar-free whole grain cereal with milk and fruit for breakfast. I w0uld be hungry again in two hours. When I was getting up early and working long hours in my nursery business I would get hungry again by late morning. I’d get a bite to eat and would get hungry again by mid afternoon. What with working long days and having dinner late, I would eat what I called my second lunch. No wonder I had gained weight. I often have a healthy snack during the day, usually a handful of nuts, sometimes a piece of nitrate-free jerky or a protein bar. Since giving up refined sugars and all grains, along with this breakfast, I am in the best shape I’ve been in decades. Dozens of times recently when I run into friends the first thing they say is, “You look good. You’ve lost weight.” I didn’t realize that what I jokingly called my Buddha belly was so obvious. I feel good and look great. This breakfast smoothie tastes good and is healthy and nutritious. I recommend that you try it and change your life. 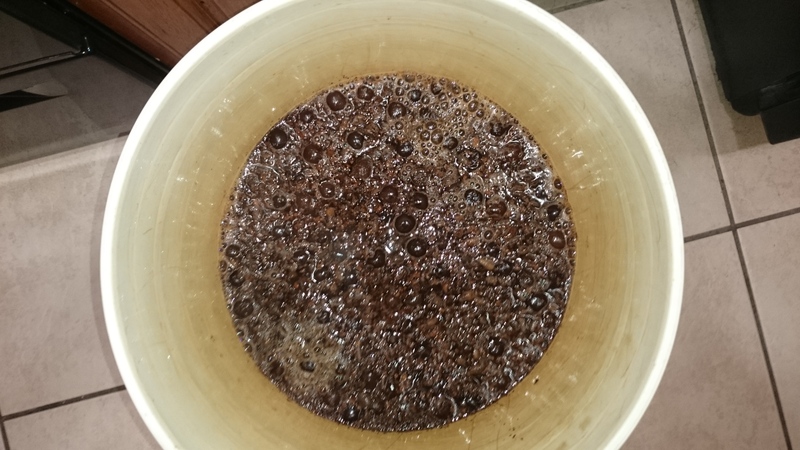 The pictures show wine aging in carboys, a bottle of Jalapeno Lime wine and Cherry Chocolate Almond wine in primary fermentation. This has been a busy season for winemaking. I’m currently writing a home winemaking book for Story Publishing and have been creating new recipes to add to the list of wines I describe in the book. I have created 144 different wines in over 30 years of winemaking and only four of those are made from grapes. I will discuss all of these wines in the book as well as describe my method of winemaking which doesn’t seem to be very common among other home winemakers. Most of them use chemicals such as sulfites as well as other additives and are in a hurry to bottle and drink their wines. I use no sulfites or any other additives and age most of my wines in bulk for a least a year before bottling. I have become active in three Facebook home winemaking groups to share my experiences and see what other winemakers are doing. 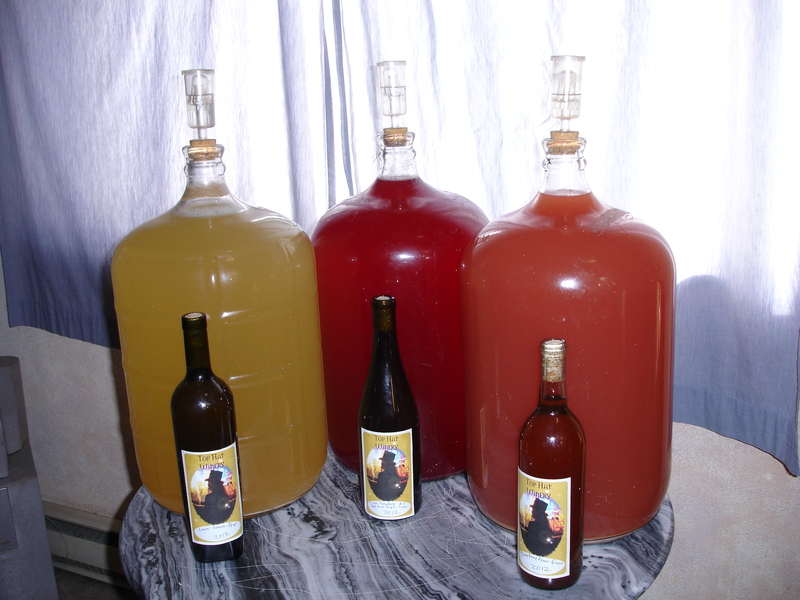 A few grow their own grapes, many use winemaking kits with canned grape juices to make traditional wines and most venture into making what are called “country wines” which are wines made from ingredients other than grapes. Some people are wildly experimental, including making wines from crushed candies like peppermint sticks and skittles. I’ve used a wide variety of fruits, vegetables, flowers, spices and herbs to make my wines. My most unique wines are fermented from citrus and hot peppers, starting with Jalapeno Lime in 1992. I’ve since made more than 30 different hot pepper/citrus wines, some of them several times. Perhaps the most unusual wines I’ve created are Burgundy Kale and Garlic Chive Flower. I like flower wines and my favorites out of more than ten varieties are Dandelion, Elderflower, Jasmine and Vanilla Rose Petal. The oldest wine in my cellar is a 1986 Lavender. Out of more than 10 different herbal wines, my favorites are Sweet Basil, French Tarragon and Double Lemon Lime Basil which was fermented from lemons, limes, lemon basil and lime basil. 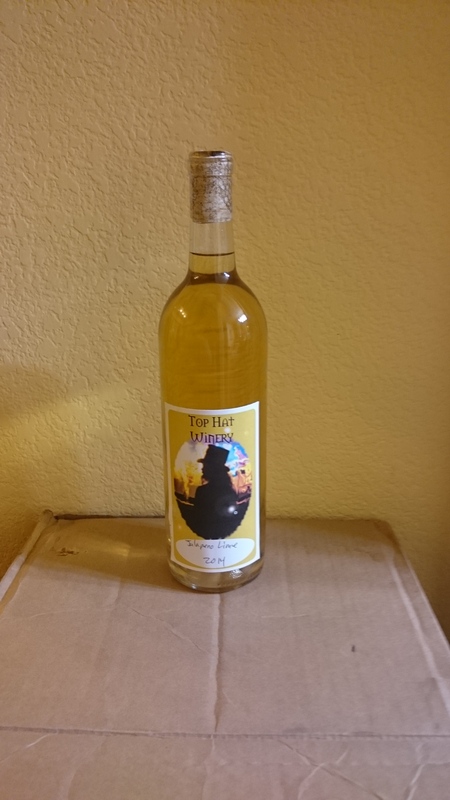 The most unusual herbal wines I’ve made include marijuana … I do live in Colorado. I’ve made several wines with chocolate. The first ones were made with cocoa powder but I’ve since switched to using cocoa bean hulls which give a much better chocolate flavor. My favorites so far are Blueberry Chocolate Chocolate Mint and Orange Mole. There are several tomato wines in the cellar. The best one is called Tomato Italiano, made from heirloom tomatoes, onions, garlic, celery, bell pepper, basil and oregano. It is a beautiful wine that tastes like marinara sauce and is also a good cooking wine which can be used as a substitute for vinegar in making salad dressings. I served it once with an appetizer sword piercing a cherry tomato and a venison meatball calling it a Meatball Martini. My recent wines since signing the contract to produce the book include Plumbarb(plum rhubarb,) Burgundy Kale, Mandarin Chocolate Chocolate Habanero, Cherry Chocolate Almond and Mary Jane’s Grapes, made with grapes and cannabis. I have several new wines planned including Tangerine Brainstrain(a superhot pepper I grew) and Chocolate which may become Chocolate Coffee. I will be growing several new hot peppers this year to use in hot pepper citrus wines: Brazilian Starfish, Volcano and Count Dracula. I name all my wines after the main ingredients. My favorite names so far are Buddha’s Hand Cherry Bomb and Kumquat Kung Pao, both of which are hot pepper citrus wines. Home winemaking has enriched my life. I’ve given many friends the opportunity to stomp fruit. I have a large variety of wines to share with friends and always have at hand a much appreciated homemade gift for almost any occasion. I would recommend a home winemaking hobby to anyone interested in wine. Cathy and I love to visit National Parks. The backstory here actually started the day after we got married in 2013. We left on a 6000 mile road trip honeymoon during which we visited Grand Teton, Yellowstone, Glacier and Olympic National Parks. We also drove up the spectacular Columbia River Gorge National Scenic Area as we headed back east toward Colorado. Before the year was out, we also visited Padre Island National Seashore and Big Bend National Park. In 2014, National Parks weren’t the main destination of our trips, but we managed to visit a few along the way. On a February trip to the Tucson Gem Show we visited Petrified Forest, Painted Desert and Saguaro National Parks. On a May trip to help Ideawild.org with an annual benefit, we visited Badlands National Park, Jewel Cave National Monument and Mt. Rushmore National Memorial. Our longest trip that year was to the Hamptons on Long Island with no National Parks in the plan although we did manage to visit the Indiana Dunes National Seashore on the way home. 2015 became the year of the National Parks when we registered for a seminar in San Jose, CA and decided to make it a road trip with an extra week to visit several National Parks. 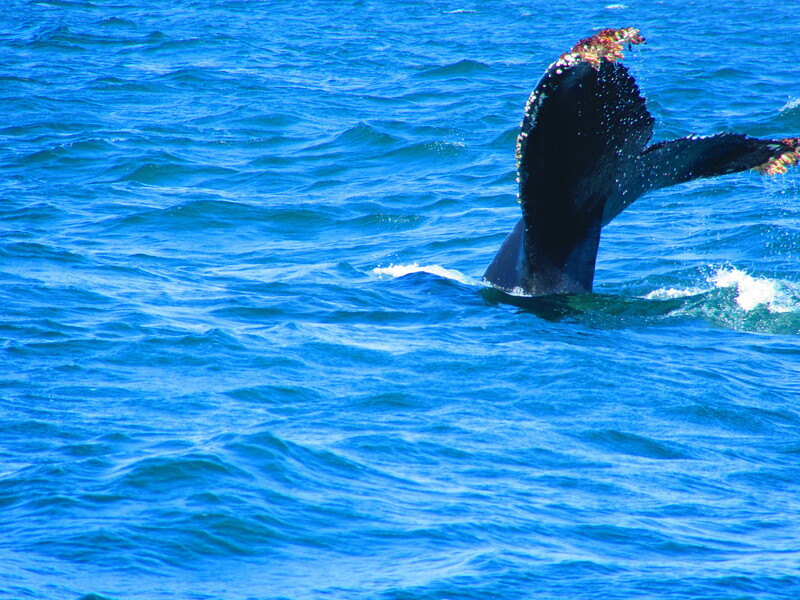 After the seminar, we started our vacation by whale watching in Monterey Bay National Marine Sanctuary. We then headed for our National Park destinations. 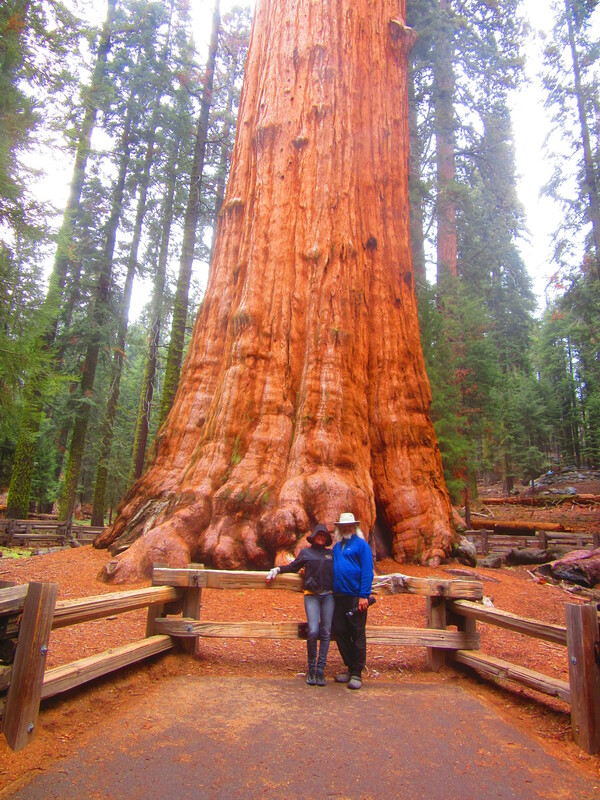 Our first stop was Sequoia which was awe-inspiring for me as a tree lover whose longest career period involved being a tree artist owning a bonsai tree nursery for more than 20 years. We love to go on hikes during our visits and the hikes in the Olympic rain forests and in Sequoia are among our favorites. We left Sequoia National Park by driving through Kings Canyon National Park and continued on to Yosemite. It was cold, rainy and foggy during our visit to Yosemite. We couldn’t even see Half Dome because of the fog and low hanging clouds. The best part of Yosemite was the waterfalls were full and spectacular. The fog made this a mysterious adventure with every view shrouded by the fog. Our original intent was to travel through Yosemite, coming out on the east side of the Sierras, travelling south to perhaps visit Death Valley before heading home. Even though it was mid-May, the pass over the mountains was closed because of snow. That night, sitting in our hotel room we looked at maps and discussed our options. We decided to drive south to visit Joshua Tree National Park. Joshua Tree was a delightful surprise. The trees were unique and spectacular but we were also amazed by the wildflowers including blooming cactus and the spectacular rock formations. Our best hike here was to the 29 Palms Oasis. A three mile roundtrip hike through desert hills uncovered a hidden pocket of green. 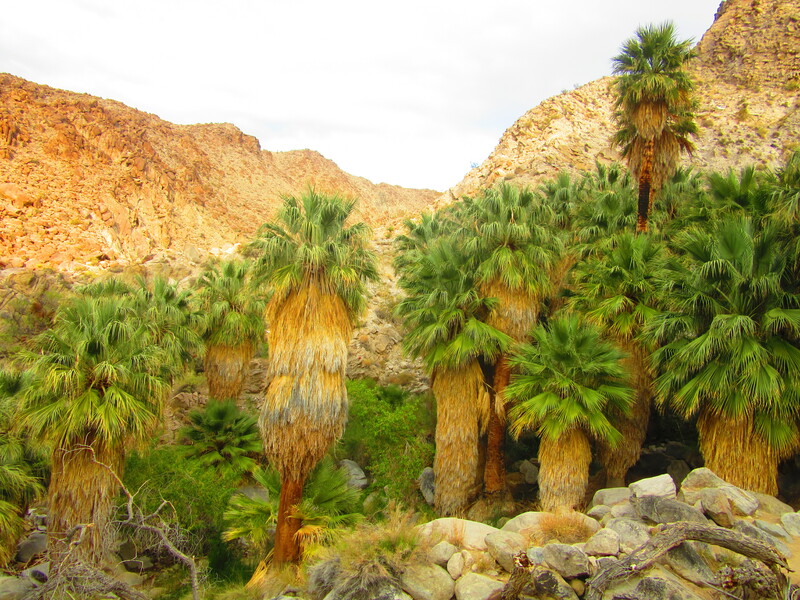 There were beautiful red-spined cactus scattered across the hills but the intense green of the oasis was an incredible contrast to the desert colors of tans and reds. Our hike back out was to a beautiful desert sunset. Our path home was through Utah giving us several more National Park opportunities. Our first stop was Zion and I understand why everyone who has visited there raves about it. We only had one day and resolved to return another time and spend more time there. Our next stop was Bryce Canyon National Park. Southern Utah is just a never ending panorama of spectacular rock formations in every shade from white through tans, browns and reds to black. Everywhere we looked was another picture opportunity. Cathy took more than 500 pictures on this trip and I couldn’t resist taking many of the same shots with my phone even though our camera took better photos. We had two more stops on our route through Utah. 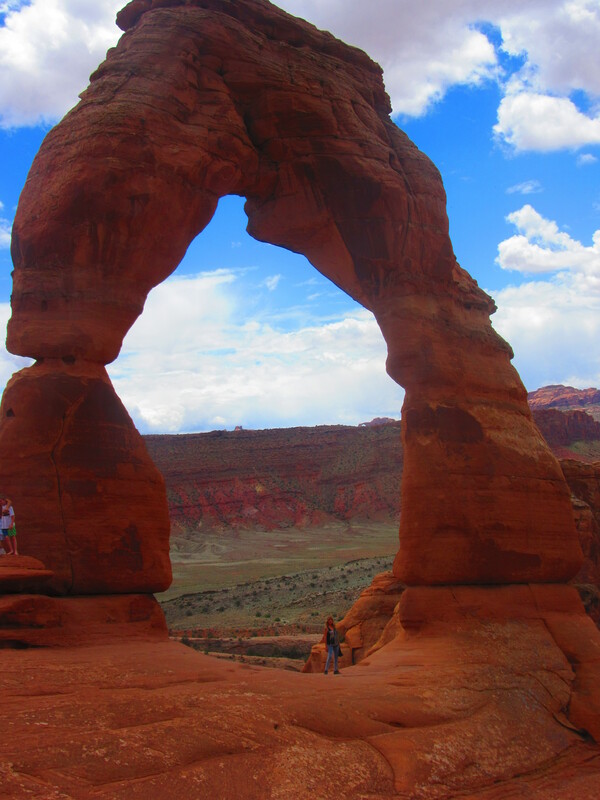 I had been to Canyonlands and Arches National Parks in the past but it was fun to share them with Cathy. We went on numerous hikes to see the sights and my favorite was to Delicate Arch even though it was a crowded trail and location. Delicate Arch is one of my favorite places. On my first visit there with a high school friend, we backpacked in, spent the night in the bowl beneath the arch and had plenty of time there to ourselves, including a sunset and sunrise. Cathy and I also spent time in Canyonlands with its spectacular views, including a visit to Deadhorse Point State Park. Technically outside the National Park, it has the most spectacular viewpoint in the area and is a must stop if you visit Canyonlands. Our next trip was to another seminar in Los Angeles. 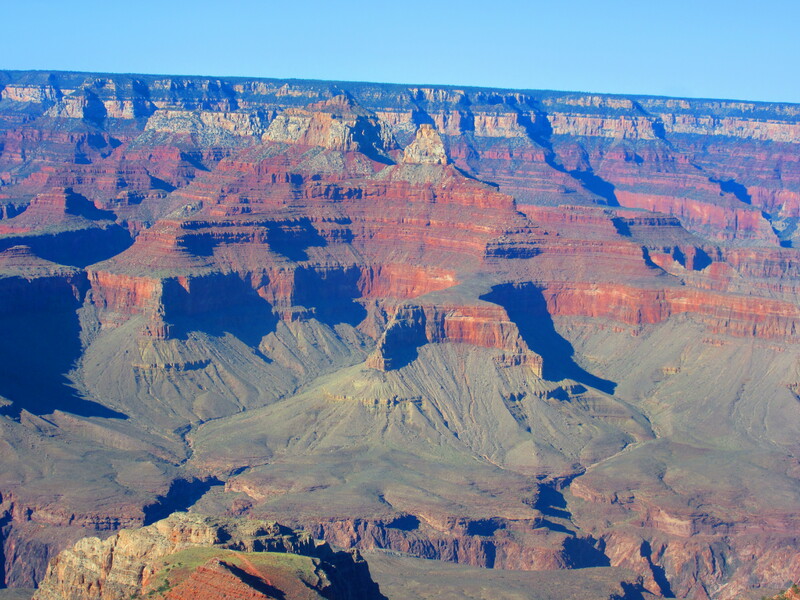 We didn’t have the extra time we took on our previous trip, but did stop to visit Grand Canyon National park. We did a several mile hike down into the canyon on Bright Angel trail, something I had wanted to do for a long time, hiking back out to a beautiful sunset over the canyon. On our drive back through northeast Arizona, we had a delightful experience when we saw a hand painted sign on the side of the road along U.S. Highway 160 saying dinosaur tracks. We pulled off to find an undeveloped site on an Indian reservation where we had an entertaining young man guide us out on a hike to see tracks and dinosaur bones in situ. He gave me 4 pieces of fossilized coral from the area. We left him with a tip and Cathy picked out several pieces of jewelry from his relatives that had a stand there. 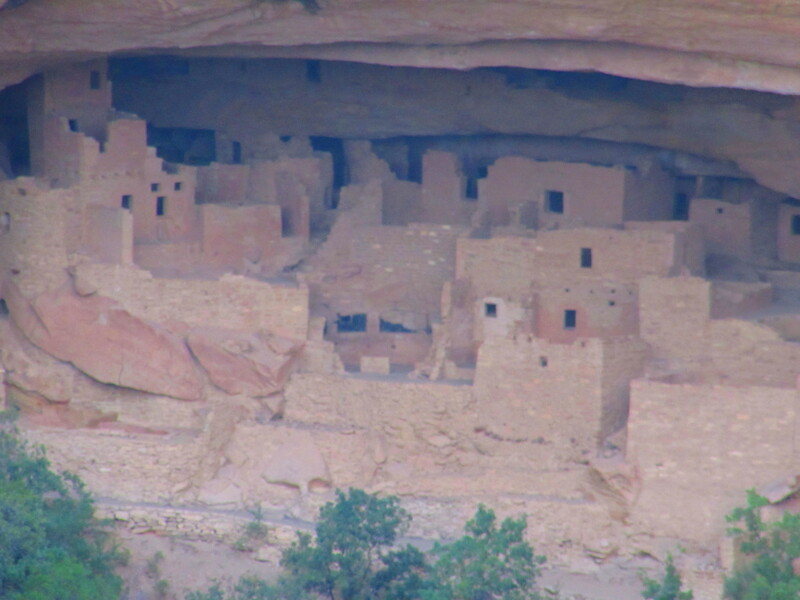 Our last stop on this trip was Mesa Verde National Park. We got there late in the day, but had time to do a couple hikes and visit some of the ruins. It had sure changed since I was there many years ago. We had to buy tickets to visit Cliff Palace the next morning on a guided tour. Mesa Verde has become so crowded since my first visit as a teenager that the buildings were being damaged just from all the traffic and several of the sites were ticket only tours with some areas off limits. It was still a fascinating visit and we went on several hikes to visit ruins and overlooks. Our next trip was a short adventure to celebrate our second anniversary. We spent a night in Pagosa Springs with a delightful evening at the hot springs there. On the second day we visited a silver mine near Creede and ended our day in the Black Canyon of the Gunnison National Park at sunset. We spent the next day hiking around Crested Butte and made a stop at Marble, Colorado on our way home. Marble is the source of some of the best, pure white marble in the world and is the source of much of the marble used in monuments around Washington, D.C. We collected some small pieces of that marble to add to our rock collection. Our last trip of the year was to yet another seminar in Los Angeles which was the topic of my last blog post. 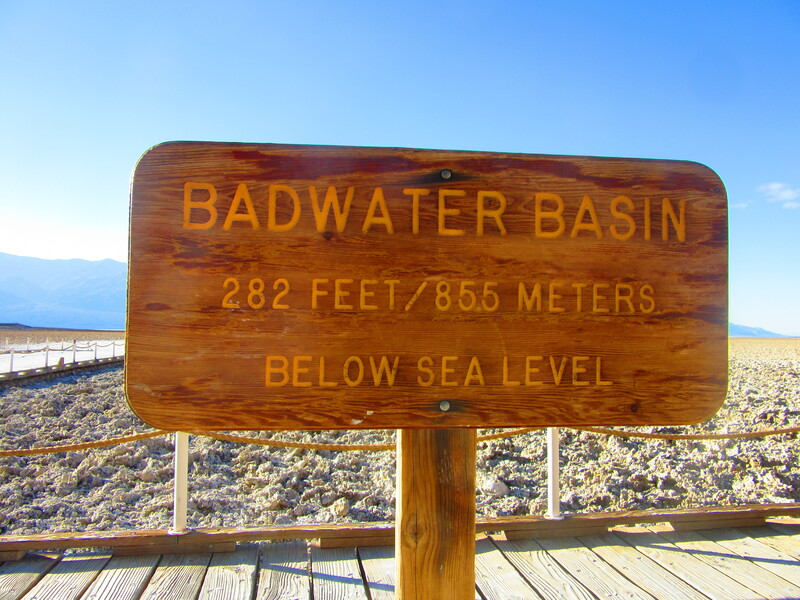 After the seminar, we spent a day in Death Valley National Park. Such an interesting landscape, we were there with a temperature of 67 degrees on the day when a massive snowstorm closed schools and businesses in our hometown. That finished our year of the National Park visits and we spent nights in Las Vegas and Santa Fe on our way home. I’m not sure what new parks we may add to our total in 2016, but we do have several trips planned back to Los Angeles again. My wife Cathy and I registered for a workshop with Dr. James Key, an award winning professor of rhetoric and did a road trip to California to attend. His goal is to help entrepreneurs create their “gold story,” the story of their life and business that would encourage potential clients to work with them. It was an inspiring three days with a master storyteller. It began with learning the elements of story. A story is “a character who wants something, overcomes obstacles to get it (and) is forever changed in the process.” The story itself consists of the backstory, an inciting incident, the story spine, the crisis/climax and a resolution. The first day lasted twelve and a half hours, covering technical details of the different parts of story, the audience and how these parts relate to each other. After a long day crammed full of information, we spent the last part of the day watching the classic movie, The Wizard of Oz. We then analyzed the movie through the rest of the weekend with a partner, in small groups and with Dr. Key lecturing and leading the whole group in discussion. 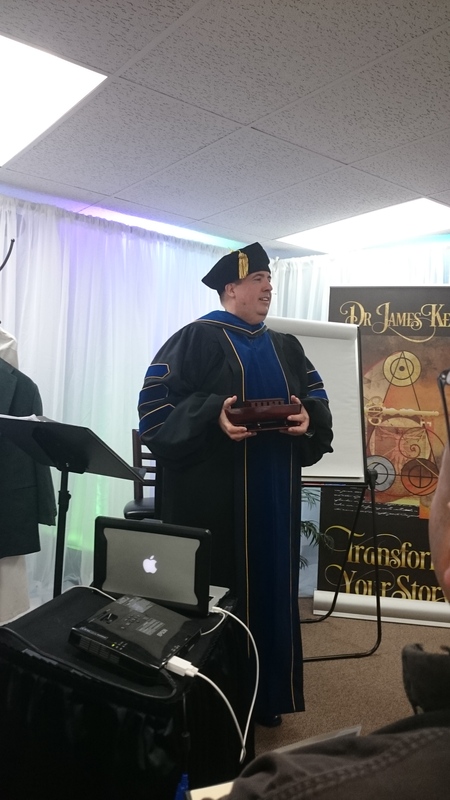 Dr. Key livened things up by dressing in costume during the weekend. During lectures he dressed in classic professor robes, switching to a lab coat and goggles when we switched to “lab” work, analyzing the movie and story elements. We finished the weekend with writing exercises and working with a partner, describing the basic elements of our own “gold story,” what results we desire from creating this story and the obstacles we face in creating our story. 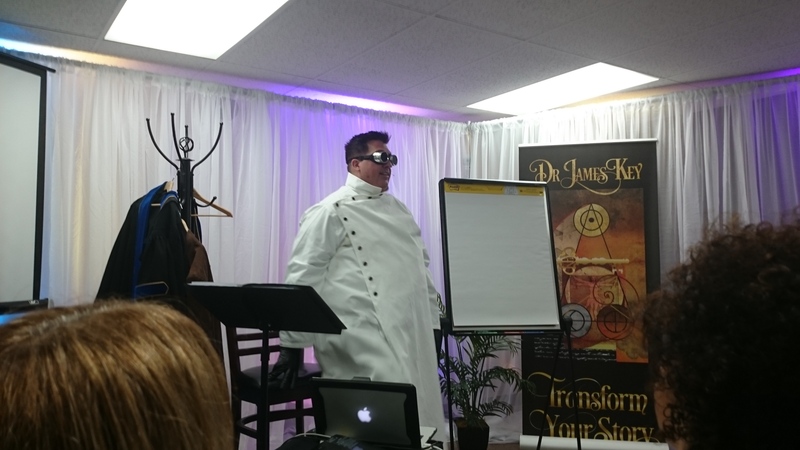 Cathy and I were both inspired by with our weekend experience and Dr. Key. We will return to the Los Angeles area to work with him again in a small group limited to twelve people. In that workshop we will create our gold stories with feedback from Dr. Key and the others in the group. We will also learn to present our story in several different timed lengths to match these to specific audience opportunities while getting feedback from others to refine our presentations. We topped off our California trip with a fun day in Disneyland and a day exploring Death Valley National Park. We love to visit National Parks and my next blog will discuss our busy year of visiting many National Parks. Death Valley is an interesting landscape and we were there with a temperature of 67 degrees on a day when our home town of Fort Collins had a massive snowstorm that closed schools for the first time in over two years. After our day in Death Valley, we spent a night in Las Vegas and a night in Santa Fe on our way home. Most nights I go for a walk before bedtime, usually between midnight and 2am. In the summer when it is warm, my wife Cathy usually accompanies me. When it is cold, I walk by myself. 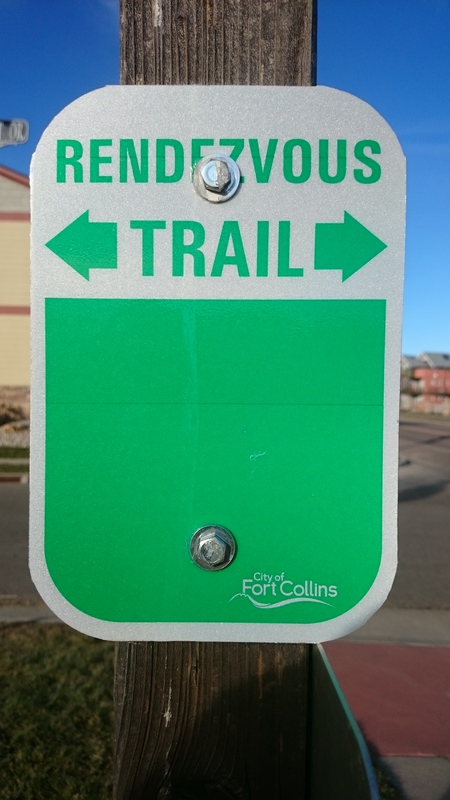 Fort Collins has an extensive trail system and the Rendezvous Trail runs right by our home. It has a fairly wide open area along the trail with a creek that runs through it. Except when we are going through a drought, one can usually hear the babbling brook during the walk and depending on which route I take, I can cross it several times. It is a peaceful time to walk, seldom seeing anyone except occasionally on weekend nights during the summer. Even here within the city I can see plenty of stars, sometimes meteors and planets. Often the moon lights my way, giving me a moon shadow. Sometimes I walk in the rain and during the winter there can be snow on the ground or falling. It is not as dark out when there is snow on the ground to reflect light from the night sky and streetlamps. It is especially bright when there is a near-full moon. Snow falling is always beautiful, quiet and peaceful as long as there is no wind blowing it into my face. There are also wildlife encounters at night. Besides the natural area along the trail, when I reach the farthest point from home I am within a mile of several large lakes and the Cache la Poudre river. Often there are owls hooting, usually more than one calling back and forth. Sometimes I hear a pack of coyotes howling in the distance. Especially during winter, I hear Canadian geese honking every night, both from where they are spending the night on lakes and often flying overhead although they are seldom visible when flying at night. 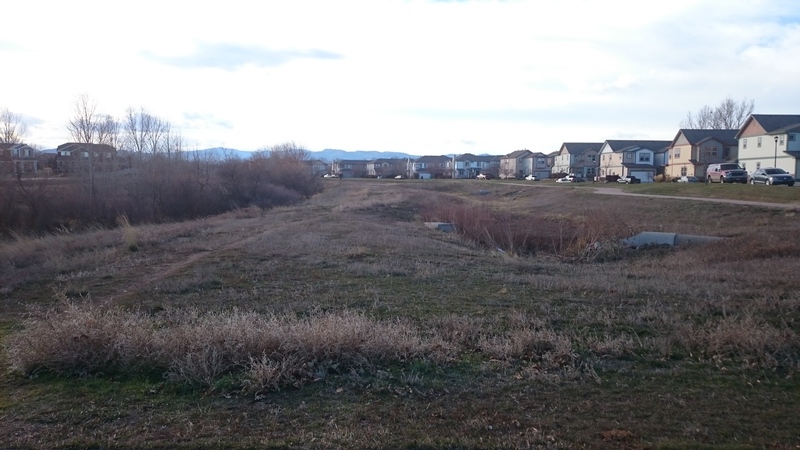 One memorable night I was walking with Cathy along the trail with the neighborhood townhouses on our right and the open area on our left. Suddenly a red fox came running out from between the townhouses, crossing our path and entering the open space carrying a rabbit in its jaws. That summer we often saw a red fox and the kits she was raising in the open space. On rare occasions there is a little excitement. One night I was walking on the trail next to the townhouses when I came across a bicycle lying next to the path with a flashing headlight and nobody around. It was a dark night and off to the right, the ground drops off into a water retention hollow before rising up again and then dropping off into the creek. I didn’t see anyone but it was too dark to see if there might be someone injured down in the ditch. I jogged home, told my wife what I had seen and grabbed a flashlight to check the ditch. I couldn’t find anyone and continued walking down the trail. Near the spot where I turned around, there was another bike lying beside the trail. On the way back the bike with the flashing light was still there. As I neared home, I could hear someone yelling. My neighbor and his girlfriend were in the driveway between his garage and mine. My wife had heard all the fuss and had come outside to see what was up. Someone had stolen three bicycles out of my neighbor’s garage and he was very angry. I told him what I had seen and all four of us took off down the trail. Sure enough, that was one of his bikes flashing next to the trail. We continued down the path, searching both sides of the trail with my flashlight until we came to the second bike. We never found the third bike which he said was the most valuable one. Later that night he called the police and filed a report although that bike was never recovered. A few weeks later, I was on my nightly walk when I reached a point where sometimes I turn around or have to cross a road and a bridge over the creek to continue along the trail. There was a police car parked on the bridge. Another patrol car pulled up and the officer got out. I decided to turn around and head back when the two officers, flashlights in hand started rapidly following me down the path. I stopped to wait and see what they wanted. One of the officers was the one who responded to my neighbor’s call about the bicycles and knew I often did late night walks. Apparently, someone had called in a complaint, claiming they heard a loud noise that sounded like a gunshot. They asked if I had heard anything. I hadn’t and they turned around to go back to their patrol cars. Most nights it is a quiet, peaceful walk that relaxes me just before bed. I especially enjoy the summer nights when I walk hand in hand with my wife. Those nights are also quiet and peaceful as we seldom talk, just enjoying the night air, beautiful sky and each others company.